MassGenie.com Marketplace launched in mid-2017 is a unique online crowd shopping marketplace site, which combines the power of crowdsourcing and ecommerce. The site now has over 1.3 million products and over 13,000 brands. Over 675,000 users have visited the site since its launch. MassGenie is based in Irvine, California, which is home to Orange County’s thriving tech industry and University of California, Irvine. 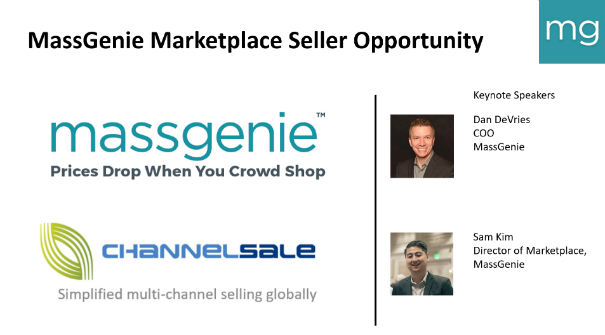 ChannelSale equips online Sellers with cutting edge powerful software solutions and expert services for creating and sync’ing product listings, inventory, orders across Amazon, eBay, Walmart, Google, Facebook, Jet and +200 more shopping sites globally via a single software interface. Making online Seller Success stories since 2007! This entry was posted in MassGenie Marketplace Seller, Webinar and tagged MassGenie Marketplace Seller, webinar on August 18, 2018 by admin.